Registration is now open for our Spring Conference on March 15th at Pitt Community College. The program will begin at 10:00 and end at 2:20. Registration will begin at 9:30. Our CTPA University members will be available to speak with you and share information about their programs beginning at 9:15. There is a $25.00 registration fee, and lunch will be provided. We have a great agenda planned for you, and as always representatives from the system office and TAC will be there to give us updates. Information about hotels and the agenda will be posted on the CTPA website shortly. Spring CTPA meeting will be held at Pitt Community College on March 15, 2019 from 10 am to 2:15 pm. More details coming soon. If you were unable to attend the CTPA Fall meeting at the NC Community College System Conference in Raleigh in October, we have posted below the PowerPoint slides from the presentations from Dr. Lisa Chapman, Senior Vice President/Chief Academic Officer of the NC Community Colleges, and Dr. Tracy Mancini, Vice President of Instruction and Student Services at Carteret Community College and a member of the Transfer Advisory Committee. If you're planning to attend the NC Community College System Conference in October, we hope you'll join us for a breakfast meeting on Tuesday, October 9, from 7:00-8:15 am. More details coming soon. Carteret Community College is delighted to host Dr. Chad Hoggan from NC State University’s doctoral program in Community College Leadership for a day of professional development workshops for faculty on July 18. Topics include "The Adult Learner" and "Effective Instruction and Continuous Improvement." Faculty can register for either or both of the workshops. Registration is open to all community college faculty. Please view this link for registration with anyone you think may be interested in taking advantage of this opportunity. The North Carolina College Transfer Program Association is looking for community college and university staff or faculty to serve on the CTPA Board (elected officers). CTPA seeks nominations for the following officer positions: President-Elect/Treasurer, Secretary, Publicity Officer, two community-college representatives from each of the three regions, one public-university representative from each region, and one independent-college or independent-university representative from each region. Each officer serves for a term of two years beginning August 1 of the year in which officers are elected. The President-Elect automatically succeeds the President at the end of the President's term. Officers will meet in person at least twice a year with additional email communication as needed. Please consider nominating yourself or a colleague (with their permission, of course!) for these open positions. Please email me your interest at woodson.heather@gaston.edu by June 1, 2018. Thank you for considering service on the CTPA Board! Here are links to the presentations from the CTPA Spring Meeting at Davidson County Community College on March 2, 2018. The North Carolina Community College AFA Association published links to statewide updates and resources in their recent conference program. Click here to access those resources. The 2018 CTPA Spring Meeting will include speakers about those important state topics which impact transfer, student success, curriculum, and more. The organization’s first state-wide meeting (a FREE drive-in “unconference”) will be held on Friday, February 16, 2018 from 10-3 in Pittsboro. Central Carolina CC is the college host, and the NC Student Success Center will provide lunch and all materials. Priority registration is reserved for two persons per community college and one university transfer advisor until January 19. Registration will open to everyone on January 20. Registration ends on February 2. Click here to register. Note: An agenda with directions and related information will be available on the NC Student Success Center website on January 8. Please mark Friday, March 2, on your calendar to attend the CTPA Spring meeting at Davidson County Community College. In early January I’ll send registration and hotel information for the CTPA meeting. CTPA will be partnering with the NC Student Success Center to coordinating Spring meetings in 2018. On Thursday, March 1, the NC Student Success Center will present Pathways to Transfer Success: Transfer Advising Workshop. On Thursday, March 2, the CTPA Spring Meeting will be held. Both meetings will be held at the Rittling Center at Davidson. Priority registration is currently occurring for the Pathways to Transfer Success: Transfer Advising Workshop. To read the minutes of the Fall 2017 Board Meeting, please click here. This year East Carolina University is proud to extend a “Save the Date” for the 1st Annual Western Transfer Summit in partnership with Gaston College. This professional development event will be hosted at Gaston College on Friday, December 1st, 8:30-12 pm with registration opening mid-October. Please click here to see the flyer and feel free to pass it along to any of your fellow colleagues who might be interested in joining us. If you have any questions regarding this event, you are welcome to contact Erica Hoyt at hoyte@ecu.edu or by phone 252-328-9495. We are looking forward to meeting our western NC Community College partners! The NC Student Success Center is pleased to announce a new resource site for Transfer Student Success. Thanks to the NCCCS Career and Technical Education team for making this Moodle course available. Currently, the site is a "work in progress" with helpful resources for instructors, counselors, advisors, and others. Additional resources from participants who attended three regional ACA 122 workshops in June 2017 will be uploaded soon. Future plans include creating a collaboration site where colleagues may share ideas, materials, and other resources. Meanwhile, we hope you will visit and take our quick survey to let us know what you think. Use the survey to share your ideas for learning and collaborating for Transfer Student Success. Stay tuned to the NC Student Success Center website for updates. We will launch our Top 10 Recommendations for Transfer Success later this month. The System Office is examining models to improve Developmental Education and increase success rates for gateway math and English courses. These models address the racial and socioeconomic achievement gap of students and allow for the high-touch supports that our most academically under prepared students require. This exploration, a continuation of the work of the redesign of Developmental Education, is in the initial stages of development, the thought process. College and Career Readiness has been part of this discussion as their work is also focused on increasing the number of academically under prepared students to transition to post-secondary education. We know we have the expertise to achieve these goals! The Office of Undergraduate Admissions at N.C. A&T would like to invite you to participate in one of our regional Transfer Advisor sessions. Our goal is to provide information to you about N.C. A&T and the opportunities that we can provide to your students. Additionally, by participating in this session, you have a unique opportunity to provide insight to the Office of Undergraduate Admissions on how we can best serve you and your students throughout the research and recruitment phase of their transfer exploration. We hope to see you soon! Elizabeth Cox Brand, Executive Director of the Oregon Student Success Center, collaborated with Education Northwest to produce resources for trauma-informed practice for higher education. Click here to find the North Carolina Multiple Measures Implementation and Outcomes Study: Final Report, which Susan Barbitta has been kind enough to share with our group. The report highlights the work done by 6 colleges who implemented student support programs for a target population of students enrolling in college-level courses via the multiple measures waiver. This target population consisted of students who fell within the 2.6-3.0 GPA. The colleges implemented interventions to support students in gateway math and English courses. Through the analysis of quantitative and qualitative data, the report indicates that “initial evidence pointed to the desired outcomes as related to the target students and the student support interventions: Overall, the average grade attained by students attempting the targeted classes increased, which goes hand-in-hand with an increasing trend in the share of students attaining A- /B-/C-grades and a declining share of D-grades. While overall grade attainment increased, the share of target students who withdrew from the targeted courses also declined, indicating that students' confidence levels may have been given a boost as a result of the implemented student supports." Please see the attached Save the Date flyer for Professional Peer Academy hosted at Nash Community as well as the Call for Proposal link. The theme for this year's conference is Teaching Beyond the Content. We look forward to 2 days of collaboration among peers to learn research-based best practices to help our students both in and outside of the classroom. Below are some presentations from the Spring Meeting. Click here to read the minutes of the meeting. As always, the CTPA Spring Meeting will include speakers about timely topics impacting transfer, student success, curriculum, and more. We are finalizing the agenda and welcome your input. Area Hotels: Information is attached about several local hotels. If you have questions about lodging, please contact Pat Jackson at Pitt Community College, 252-493-7305, pjackson@email.pittcc.edu. Please don’t hesitate to contact me if you have questions about the meeting or suggestions for the agenda, Betty Hatcher, President, CTPA, hatcherb@cravencc.edu. East Carolina University and Pitt Community College are pleased to invite NC Community College professionals to the 3rd Annual Transfer Summit at the ECU Heart Institute on Thursday, February 16th. This is an excellent opportunity to learn more about ECU’s top transfer majors, the admissions process, advising resources and transfer degree plans, while connecting with other NC Community College professionals and ECU staff. Registration is now OPEN and can be accessed via this link, survey.ecu.edu/2017transfer or if you click on the flyer below (also, see attached). Please feel free to share the invite with any of your fellow colleagues that would be interested in attending. Note: This free event requires online registration by Monday, February 6th (a light breakfast and lunch will be included!) and is only open to NC Community College professionals. The College of Natural Resources invites all Community College Counselors and Academic Advisors to our interactive workshop on the beautiful NC State campus. We offer unique degrees in engineering, the environment, and tourism. We will also be discussing a brand new scholarship program at NC State especially for community college transfers interested in STEM Majors! • NEW: Separate tracks for returning attendees! Workshop is free and lunch is provided. If interested kindly REGISTER by Friday February 3, 2017. For questions, contact Tiffany McLean at tiffany_mclean@ncsu.edu or by phone at (919) 515-5510.
who could benefit from the program. The CTPA Spring Conference will be held Friday, March 3, at Pitt Community College. Please make plans to join us! The proposed amendments to the CTPA bylaws concerning length of terms for vacated positions and beginning dates of service for officers were e-mailed to the membership for approval on October 4, 2016. The amendments passed unanimously, with 65 members casting their votes in approval of the changes. You can read the updated bylaws by clicking here. If you are attending the upcoming North Carolina Community College System Conference, please consider attending the CTPA Breakfast meeting on Monday, October 10, 7:00a - 8:15a. A light continental breakfast will be provided; please check your program for the room location. Also, please stop by Booth 619 in the Exhibit Hall to talk with CTPA Board Members. If look forward to seeing you at the conference! We hope you will all join us at the CTPA Breakfast Meeting at the North Carolina Community College System Conference in Raleigh. The meeting will be 7:00-8:15 on Monday, October 10. We'll have an update from the NC Community College System Office and other transfer information news. To read the minutes of the August 26, 2016, Board Meeting, please click here . Join us for the Counselor & Advisor Visit, hosted by Appalachian's Office of Admissions! The day will feature a tour of our beautiful campus, workshops about financial aid, housing, transfer options and academics, as well as student panel discussions and a college and department fair. Lunch will be provided. We look forward to welcoming you in September! Registration is available on a first-come, first-served basis, as space is limited. We'd love to see you, so register today to secure your spot! Feel free to contact your territory admission counselor with any questions, and please pass the invitation along to others at your institution (limit: two participants per institution). Choose one of the workshops below that is convenient for you. All workshops are open to community college personnel with responsibility for advising transfer students. We will send an email confirmation, including specific workshop location information, one week before the program. Lunch will be provided at each workshop for all participants. Effective Fall 2016 there are 3 new curriculum standards for the 3 new AFA degrees including A10600 (AFA in Visual Arts), A10700 (AFA in Music), and A10800 (AFA in Theatre). The NCCC AFA Association is currently working on a uniform articulation agreement and will provide updates although this is a lengthy process. For more information, please contact Jenn Selby,President, NCCC AFA Association, jenn.selby@rccc.edu . Below are some of the presentations from our Spring 2016 Conference, held on February 19 at Gaston College. Click here for minutes from the meeting. We will have some time for general questions and answers, as well as time at lunch for some networking. However, if you have questions or other potential agenda items that you would like to send me now, please do so at Woodson.heather@gaston.edu . We want to make sure that we are serving the needs of the membership and appreciate your suggestions! We look forward to seeing you on February 19th! Please email CTPA President Heather Woodson (Woodson.heather@gaston.edu) with questions, concerns, ideas, etc.! East Carolina University and Pitt Community College are pleased to invite NC Community College professionals to the 2nd Annual Transfer Summit at the ECU Heart Institute on Thursday, February 11th. This is an excellent opportunity to learn more about ECU degree plans, the admissions process, transfer student services, while connecting with other NC Community College professionals, ECU staff, and current transfer students. Registration is now OPEN and can be accessed via this link, http://bitly.com/2016transfer , which is also embedded in the attached flyer. Please feel free to pass along the invite to any of your fellow colleagues that would be interested in attending. Note: This free event requires online registration by Monday, February 1st (a light breakfast and boxed lunch included!) and is only open to NC Community College professionals. The College of Natural Resources invites all Community College Counselors and Academic Advisors to our interactive workshop on January 22, 2016 from 9:45am until 2:00pm on the beautiful NC State campus. We offer unique degrees in engineering, the environment, and tourism. Workshop is free, and lunch is provided. If interested kindly REGISTER by Friday January 15, 2016. For questions, contact Tiffany McLean at tiffany_mclean@ncsu.edu or by phone at (919) 515-5510. The spring CTPA conference will be held February 19, 2016, at Gaston College from 10 am until 3 pm. More information about registration, hotel, directions, etc. will be sent out soon. The cost will be $20.00. One of the planned activities is to allow participants to circulate through tables set up for discussion on specific topics. Below is the list of proposed topics. Please respond to me at Woodson.heather@gaston.edu if you would like to ADD a potential topic or if there is a topic that you would recommend that we DROP from the list. Please also indicate your top five choices. Please respond by Friday, December 18th. Thanks! We look forward to seeing you in February 2016! In Summer 2014, our newly elected president Kimberly Turk had to resign her position because of a job change. Under the by-laws, then Treasurer/President-Elect Heather Woodson stepped into the position of President. She has now served 1 ½ years as president, but, under the current by-laws, she should now go on to serve as president for two more years, filling her own elected term as president, and then continue as Immediate Past President for another two years. Since 5 ½ years is a rather long commitment, the board has proposed limiting the time an president serves to a maximum of three years. The board also felt that it would be helpful for planning if new officers began their terms with the beginning of the academic year rather than January 1, as the by-laws require. Each officer serves for a term of two years (or 3 years maximum if assuming an unexpired term), beginning August 1 of the year in which officers are elected. The President-Elect automatically succeeds the President at the end of the President's term, and the President automatically succeeds the prior Past President. b) Should the President leave office before the expiration of the regular term, the President-Elect will complete the unfinished term in addition to her/his regular term, not to exceed three years total. Please e-mail Tracy Mancini, Immediate Past CTPA President (mancinit@durhamtech.edu), with nominations for the following positions (feel free to nominate yourself). The CTPA bylaws (click here) describe the responsibilities of each position. Elections will be held electronically after our Spring 2016 meeting February 19. The National Institute for the Study of Transfer Students (NISTS) is an excellent conference for two and four year institutions. Here is the link to the website so you can learn more about previous conferences and the upcoming conference February 3-5, 2016, in Atlanta. Click here to view the minutes (opens in new window). Robeson Community College will host a meeting—Transfer Conversations-- among transfer faculty and student support staff. You are invited to attend. Tenita Philyaw-Rogers, Director of Transfer Articulation for UNC-General Administration will be a guest speaker. The symposium will take place 10am-noon in the BB&T Room of the Workforce Development Building. Click here for more information (opens in a new window). Don’t forget to “save the date” for Project Uplift 2016, North Carolina Renaissance 2016, and our new program Uplift Plus 2016. These amazing opportunities equip high-achieving, historically underrepresented students with valuable skills and new connections that will take them one step further in realizing their dream of attending college. Project Uplift is designed for high-achieving, diverse rising seniors. North Carolina Renaissance is designed for rising juniors from rural communities. Uplift Plus is designed for outstanding Project Uplift participants. Applications for all three programs will be available at diversity.unc.edu by December 1, 2015. In the meantime, if you have questions about these special opportunities, please contact project_uplift@unc.edu regarding Project Uplift and diversity@unc.edu for North Carolina Renaissance and Uplift Plus. Please plan to attend Durham Tech's Transfer Connections with a Align4NCWorks Focus. We have presenters from Appalachian State, Duke, ECU, NCA&T, NCCU, NCSU, UNC Asheville, UNC-Chapel Hill, UNC Greensboro, and Western Carolina University who will talk about internship, externship, work-study, and experiential opportunities in selected areas of study at their universities. Note that ECU will present on its impressive 2+2 program for AAS students. Click here for the program. This year we are offering the opportunity to purchase a lunch through the Bagged Lunch Company. We are charging $15 per person to cover the costs of brunch items including coffee, orange juice, coffee cake, brownie bites, fresh fruits, etc., the boxed lunch item, and a drink. Print off the list, circle the one you want, write your name on the form. Here is a link to the choice in sandwiches. She will place the final order. Of course, if you prefer to pass on the brunch and lunch, not a problem, come anyway. Please let Mary Marsha Cupitt know you are coming (cupittmm@durhamtech.edu). And feel free to forward this invitation to anyone on your campus who might be interested. The UNC-GA Transfer Student Success Website is HERE! Go to www.northcarolina.edu/transfer to explore the one-stop-shop for student to learn how to transfer to UNC campuses. below are the minutes and PowerPoints from CTPA's Spring Meeting at Gaston College on Friday, March 27, 2015. These files will open in a new window. UNC-CH is hosting the Warrior-Scholar Project this summer. The Warrior-Scholar Project is a two-week-long intensive college preparation course designed to facilitate veterans' transition from the military to college and prepare student-veterans to become academically successful leaders on a college campus. Overcoming and embracing many other challenges that are inevitably confronted by non-traditional college students, especially veterans. For more information or to apply, please go to www.warrior-scholar.org. We will have some time for general questions and answers, as well as time at lunch for some networking. However, if you have questions or other potential agenda items that you would like to suggest, please contact Heather Wilson, CTPA President at Woodson.Heather@gaston.edu. We want to make sure that we are serving the needs of the membership and appreciate your suggestions! Please register by March 6th so that we can adequately plan for food. We look forward to seeing you on March 27th! The CTPA Spring meeting will be held on Friday, March 27, 2015, from 10:00 am to 2:30 pm, at Gaston College. The college is located at 201 Highway 321 South in Dallas, NC. To register for the conference, please click here. More information on the agenda will be coming out shortly. Hello! ECU is hosting two events ideal for community college folks to attend. Both events are free and include lunch. College STAR Shared Learning Summit (January 23rd). Target audience: Faculty, disability service providers, academic support professionals, tutors, advisors, individuals who help students transition to college (from HS and to the University) and administrators who lead these areas.For registration information, click here. Navigate the Course to an ECU Baccalaureate Degree: NC Community Colleges to ECU Transfer Summit (February 12). Target audience: Transfer services professionals, faculty, advisors, and administrators who work with transfer students. If you have questions, please contact Diane J. Majewski, Ed.D.,Special Projects Director, Office of Undergraduate Studies,East Carolina University, 252-737-1019,majewskid@ecu.edu. The College of Natural Resources invites all Community College Counselors and Academic Advisors to our interactive workshop on January 30, 2015 from 10:00am until 2:00pm on the beautiful NC State campus. We offer unique degrees in engineering, the environment, and tourism. Workshop is free and lunch is provided. If interested please REGISTER by Friday January 23, 2015. For questions please contact Tiffany McLean at tiffany_mclean@ncsu.edu or by phone at (919) 515-5510. Attached (click here) are my notes from this meeting. Please feel free to share and don’t hesitate to contact me if I can provide any clarification. Developmental Redesign and Multiple Measures: How Are Students Faring? Durham Tech invites you to its annual Transfer Connections Conference highlighting transfer opportunities at area universities. This year we are focusing on STEM opportunities at ECU, Meredith College, NCA&T, NCCU, NCSU, UNC-CH, and UNCG. Click here for the tentative program, map, and parking permit. Here is the link for the Fall 2013 CTPA Newsletter. Many thanks to Mary Marsha Cupitt for putting this issue together. In it you will read the results of the Fall 2013 elections, information on incoming president Kimberly Turk, and updates on the CAA revision process and the reverse transfer initiative, Credit When It's Due. For many, the road to a four-year degree begins at a community college. More than 15 years ago, North Carolina's General Assembly introduced legislation making the college transfer process more efficient for students who were pursuing their first two years of post secondary education at a community college. However, the 16-year-old Comprehensive Articulation Agreement (CAA) between the two higher education systems was in need of an update. "The goal is to have the completed articulation agreement finalized to go to our state board and the UNC board of governors in February of 2014 for implementation Fall of 2014," according to Wesley Beddard, N.C. Community College Systems Associate Vice President for Student Learning and Success. Through the previous agreement, community college students completed 64 credit hours for an Associate in Science or Associate in Arts degree which contained the Core 44 credits that met the general education requirements at any North Carolina university; however, only 13 percent of transfer students were completing the core, subjecting them to course-by-course transfer evaluation. In an effort to create efficiency and simplicity, the number of credits required for a transfer Associate Degree has been shortened to 60, aligning with the universities' standard 120 hour Bachelor's Degree. The degree has been restructured to contain two sets of 30 credit hours, allowing students to earn credits that will fit into their major after they transfer. "The first 30 hours will be universal," Beddard says. For the second set of 30, "fifteen of those will be general education, and the students are not required, but strongly encouraged to pick those based on where they're planning to go and what they plan to major in, and the additional 15 hours are more pre-major." The UNC System schools came together to assess community college courses, and they agreed upon which courses would count toward the general education requirements at all 16 universities. Those courses form the universal 30 credit hours which will transfer to any UNC school - even if a student does not complete the set, each individual course is guaranteed to count, unlike courses under the old CAA. The additional 30 credits are personalized to the students' college and major intentions, since some universities require specific general education courses for certain majors. The 15 pre-major courses fulfill requirements that freshmen and sophomores in the same major would take at a university. "The first part is very focused, but it's for all those students, it's common throughout the state, and then the second part gets very individualized to the student and the institution they apply to go to," Beddard says. "It's an entirely different approach then we had previously." The Reverse Transfer Credit initiative has also been added to assist transfer students - when a student transfers to a university before earning their Associate Degree, the credits taken at the university that match the community college requirements will allow the student to earn a degree. The additional degree makes students more marketable; also, studies have shown that students who earn their Associate Degree are more likely to complete their Bachelor's degree, increasing completion rates at community colleges and universities. "They've completed the courses, they've earned the credits, they just didn't earn them in the linear fashion we normally expect students to do," Beddard says. The ultimate goal of the revised Comprehensive Articulation Agreement and the Reverse Transfer option is to provide students with a clearer path to post secondary degree attainment. We had a great conference on Friday, April 19, with more than 130 attendees. Many thanks to our wonderful presenters and panelists for the valuable information they shared. As promised, their PowerPoint presentations are linked here for member reference. 3/19/13 CTPA is Now Linked In! Attached please find our second CTPA Newsletter. Many thanks to Mary Marsha (and Larry) Cupitt for putting this together and making it look so good. Please note there is only about a month left before our annual spring conference on Friday, April 19, 2013, at Wake Technical Community College. If you haven't already printed the registration form and mailed it in to Kimberly Turk, please do so soon. 2/14/13 Save the Date for Spring Conference! The 2013 College Transfer Program Association (CTPA) Conference is scheduled for Friday, April 19, 2013, at Wake Technical Community College. The conference will last from 9:30 a.m. to 2:00 p.m. Registration will be $20. Lunch will be included in the fee. Probable agenda items include an update on the CAA Review, a presentation on the ACT, a panel discussion on senior institutions' creative initiatives involving community colleges, an update on the Math CIP, and comments from the Transfer Advisory Committee (TAC). A registration form is attached. Conference information and a more detailed agenda will be sent shortly, but we wanted to let you know the date for planning purposes. Read minutes from the Fall 2012 CTPA Business Meeting here. This meeting took place on Monday, October 8, 2012, at the NCCCS Conference in Raleigh, North Carolina. Attached please find the first of a new era of CTPA newsletters to help keep you informed about CTPA meetings and the relevant issues affecting transfer between our community colleges and senior institutions. This issue includes information from our fall business meeting on the CAA Review and the curriculum math redesign effort. Many thanks to Tonia Broome for compiling, writing, and formatting this issue. We will hold our fall business meeting on Monday, October 8, from 5:30 to 7:00 p.m. in room 201 of the Raleigh Convention Center during the NCCCS Conference. The conference planners have asked us to remind you that you must be registered for/attending the NCCCS Conference in order to gain entry for the CTPA meeting. For those of you interested in CTPA business who are not planning to attend the conference, we will send minutes and a summary of the presentations soon after the meeting via email and post them to this web site. We will review the results of the recent vote on the CTPA Constitution and Bylaws and affirmation of the executive board, hear an update on the CAA Review, and more. A complete agenda will be available the week of October 1. While you do not need to RSVP, it would be helpful if you sent an email to me at mancinit@durhamtech.edu if you plan to attend the fall business meeting, so we have an idea of how many agendas and handouts to print. 3:00 in our Wynn Center Multi-purpose Room. transfer programs and admissions standards. Minutes from the April 30, 2012, CTPA Spring Conference are now available. Attached is a draft of the proposed revisions to the CTPA Constitution and Bylaws. The membership will vote on these revisions in October at our fall meeting. We will send a copy via email in September before the vote to all members. Also attached is a powerpoint presentation, prepared by Diana Campbell of Forsyth Tech, highlighting the proposed changes. Please send any suggestions or questions you have about the proposed revisions to Diana at dcampbell@forsythtech.edu. 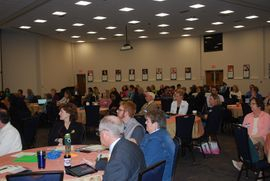 Thanks to all of you who attended the 2012 CTPA Spring Conference on April 30 at Wake Tech. Some attendees requested that the PowerPoints from presentations be made available. Thanks to our presenters, the Career and College Promise Powerpoint(2a).pptx and DEI PowerPoint.pptx presentations are linked here. Please fill out the conference survey when you receive it via email. The College Transfer Program Association (CTPA) Spring 2012 Conference will be held on Monday, April 30, 2012, at Wake Technical Community College's main campus from 8:30 a.m. to 1:00 p.m.
Coffee and a light breakfast will be served from 8:30 to 9:00 a.m. The registration fee for the conference is $10 per attendee. A registration form is attached. Please mail your form and check made out to "CTPA" by April 10 so we can give the caterers an accurate count. Receipts will be available at conference check-in. The tentative agenda for the conference includes discussions about pre-majors, assessment of university transfer programs, Career and College Promise implementation, and the Developmental Education Initiative (curriculum redesign in developmental math). A finalized agenda, directions, and parking information will be sent at a later date. Please forward this email and registration form to anyone else you think may be interested in or may benefit from the conference. 2/7/12 DATE CHANGE!!! Save the Date for Spring Conference! The 2012 College Transfer Program Association (CTPA) Conference is scheduled for Monday, April 30, 2012, at Wake Technical Community College. The conference will last from 8:30 a.m. to 1:00 p.m. Registration will be $10. Probable agenda items include the use and customization of pre-majors, implementation of Career and College Promise, curriculum design changes, and assessment of university transfer programs. Official registration and conference information will be sent shortly, but we wanted to let you know the date now for planning purposes. Attached here are minutes from the January 27, 2012, CTPA Executive Board Meeting. 1/20/12 How Does Your Institution Use AP and IB Test Scores? Please participate in the CTPA BLOG on AP and IB scores. Durham Technical Community College is pleased to invite all transfer counselors and other interested community college faculty/staff to attend its 3rd Annual University Program Information Sessions on Friday, October 21, 2011, from 8:30 a.m. until 4 p.m in the Collins Auditorium, room 278. Durham Tech's Arts, Sciences, and University Transfer department has invited university departments with unique opportunities for community college students to come to campus to present the details and features of their programs. Durham Tech students, staff, and faculty are welcome to attend to learn more about exciting transfer options for our students. The event is free and open to academic advisors from other community colleges in central North Carolina and to area high school counselors. For more information, please see this schedule for the event. If you have any questions, you may contact Tracy Mancini at Durham Tech at mancinit@durhamtech.edu or (919) 536-7223, ext. 8011. The turnout for the spring conference was wonderful, and we received a great deal of positive feedback on the usefulness of the discussions that took place. Thanks to all of you who helped with the event, and thanks to those of you who participated. The minutes are linked here. The 2011 CTPA conference will be held this Friday, April 15, 2011 from 9:00-12:30, at Wake Technical Community College"s Main Campus. I have attached the agenda, a campus map,and a temporary parking pass. The conference will be held on the second floor of our Student Services Conference Center. Please let me know if you have any questions about the event, or if you need additional information. I look forward to seeing you this Friday! Click here for the CTPA Spring Conference 2011 registration form and a tentative agenda. With the current budget situation, we wanted to get the registration forms out to you as soon as possible. Additional information, such as driving/parking directions, and a more detailed agenda, will be sent closer to the conference date. We are extremely fortunate that Sharon Morrissey has agreed to present the keynote address. Attached is an invitation to North Carolina Central University's Transfer Counselor Luncheon. Please respond to Ms. Easterling at NCCU if you plan to attend. The minutes and resulting actions from the April 16, 2010, CTPA Spring Conference are now posted. I hope you are enjoying the beginning of the new academic year. Last year, the CTPA agreed to do a survey to determine what types of issues community college face students upon transfer. We are asking that CTPA members complete the survey or forward to the appropriate persons on their campuses to do so. I would like to have all survey results by September 15th so that I can compile the data and present to the TAC at the September meeting. The link to the survey is below. I will post minutes of the June TAC meeting as soon as they are finalized. Thank you for your help with this important effort! The College Transfer Performance begins on page 20. Attached are directions and parking information for the CTPA Spring 2010 Conference at Wake Tech's Northern Campus (remember, Northern Campus). We look forward to seeing everyone there. The following link provides a local map to the Northern Wake Campus, and also links to Mapquest and has the correct address so that folks can get directions. We are meeting in the Administration Building (Building A), in room 124/126 (this is one large room). People can park wherever; they do not need permits, and if security asks, they can just say they are attending the CTPA conference. According to WTCC-NC staff, there should be parking available at 8:30 on a Friday. 4/1/10 CTPA Spring Conference Registration Reminder! This is a final reminder that the Spring 2010 CTPA Spring Conference, which is "free," is scheduled for Friday, April 16, 2010, at Wake Tech's Northern Campus. Attached is a Registration Form (if you have not registered yet). Please send the Registration Form electronically to Becky Egbert no later than today. Her address is on the form. Additional information concerning directions and parking details will be forthcoming as we get closer to the conference. This is an excellent opportunity to see a demonstration of The Transfer Navigator degree audit feature scheduled to be available on CFNC in June 2010. There will also be a TAC/CAA update session, with real live TAC members, covering any recent changes to the CAA, including the grievance procedure. This is an opportunity to gain a fuller understanding of the protections and limitations of the CAA, to voice any concerns about the agreement, and to ask questions of the TAC members. Our current registration includes community college, UNC, privates, and CFNC personnel, so there will be a full representation of all the stakeholders in the transfer process in the state. Please take advantage of this opportunity. For those of you planning to attend, attached is the agenda for the Community College Transfer Student Conference at St. Augustine's College on March 12. Below is information about training session opportunities for North Carolina Community College Transfer Advisors and other interested Student Development personnel who are involved in the transfer process for students. The NC Community College System in collaboration with Saint Augustine's College is hosting a College Transfer Student Conference on Friday, March 12, 2010. The Conference will be held at Saint Augustine's College in Raleigh, NC in the Seby Jones Fine Arts Center from 9:30 am to 4:00 pm. This is a free conference for North Carolina Community College Transfer Advisors and other interested Student Development personnel who are involved in the transfer process for students. The conference will focus on transfer opportunities for students enrolled in North Carolina Community Colleges. During the conference participants will have the opportunity to learn more about the admissions process, transfer opportunities and student support services offered by Saint Augustine's College. A continental breakfast and luncheon meal will be provided. This webinar will be led by Monique Williamson, CFNC Transfer Articulation System Manager, Katie Prosser McInerney, CFNC Service Manager and Julia Conrad, Associate Director, GEAR UP North Carolina. This session will provide an overview of CFNC programs and resources for students and administrators. Topics of interest include Student Transfer Navigator, College Redirection Pool, CFNC Electronic Transcript System, CFNC Choices Planner Career Transitions Tool and the College Application Week state-wide event. 2/15/10 Congratulations, New CTPA Officers! The CTPA Executive Board has confirmed the election of Tonya Forbes, Dean, Mathematics and Sciences Division, Wake Technical Community College, as the new President of the College Transfer Program Association (CTPA). The Board also confirmed the election of Diane Lodder, Dean, Arts, Humanities, and Social Sciences, Wake Technical Community College, as the new President-elect. Please join us in congratulating both Tonya and Diane in their positions. We are confident that they will continue the important work of the CTPA. Let us also give our thanks to Gayle Greene for all she has done for the CTPA during her tenure as President of the organization. If you would like to nominate yourself or anyone else to one of the offices, please send a name and contact information to Dr. Thomas Gould at gouldt@durhamtech.edu no later than Friday, February 5. We plan to have the new officers installed by the conference. The College Transfer Program Association (CTPA) Spring 2010 Conference will be held on Friday, April 16, 2010, at Wake Technical Community College's Northern Wake Campus from 8:30-1:00. Due to the budget situation, we will not be charging a registration fee; however, a Registration Form is attached so we can get an accurate count. Please fill it out and send electronically to Becky Egbert (email address on form) before April 1. The CTPA will provide coffee and a light breakfast for attendees, but we will finish before lunch. We are currently working on the agenda, but CFNC has committed to a presentation on the Transfer Navigator System and members of the state Transfer Advisory Committee (The TAC) have also committed to a presentation/ discussion of the CAA and transfer-related issues. A finalized agenda and directions and other information will be sent at a later date. This is also an excellent opportunity for institutions to add any new members involved with transfer to the organization. Minutes from the December 2009 Transfer Advisory Committee are now posted here. Included is information on B-K Pre-major and EDU courses, Engineering Pre-major Revisions, Appeals Policy Process, CRC Recommendations and Action Items, and more. Please see memo regarding cancellation of the 2010 NCCCS Instructors Conference. Attached please find the most recent TAC Action Items, including an updated Transfer Course list. Open with Office Word if you have any problems. Please review the attached information concerning Independent Transfer Advisory Committee (ITAC) action items that took place on 6/23/09. The revised Independent Comprehensive Articulation Agreement (ICAA) is also attached. Attached you will find a Numbered Memo containing the May 15, 2009, State Board of Community Colleges Actions. One of the revised items at the State Board was the AFA/Art premajor. The revision is the addition of ART 244 Watercolor as a possible elective. Also revised were the Curriculum Standards for Computer Programming, Fine and Creative Woodworking, and Telecommunications Installation and Maintenance (diploma). Attached are the minutes from the Fall CTPA meeting and the January Executive Board minutes. The Fall minutes include information from the TAC presentation, specifically TAAP and Credits Originating policies; Issues of Concern within the CAA; Early College Issues; and General Education Core Reexamination. The CTPA Executive Board minutes include information about the Nominating and CTPA Constitution/ By-Laws Revision Committees, CAA Grievance, Tuition Surcharge, and more. Most notably, in light of the current budget situation, the CTPA Executive Board has decided to waive the membership fee for 2009-10 and offer free membership. Anyone wanting to add names to the membership list should fill out the attached membership form and send the name, institution, and contact information to Kimberly Turk and Thomas Gould (e-file is fine). Membership forms are also available on the CTPA website. I've also attached the current CTPA Executive Board roster and contact info. Please see the attached Numbered Memo CC08-243 (with attachment) regarding the Transfer Advisory Committee Action Items. The recent NCCCS Conference generated some discussion, from both community college and UNC quarters, about the need to review the current CAA 44-hour General Education Core Curriculum Standards for Associate in Arts and Associate in Science. The current Core has not been reviewed since implementation of the CAA in 1997. In light of recent General Education Requirement reviews and changes at a number of UNC System institutions and the continuing debate over Mathematics and Foreign Language requirements, now may be the appropriate time for a formal review. But before making an official recommendation to the TAC (Transfer Advisory Committee), we want to survey the membership. The following link will take you to a single question concerning the possible motion. Please take a moment to answer the survey before Friday, October 31. Attached are the items (numbered UNC-NCCCS memo and revised CAA) concerning the North Carolina Independent Colleges and Universities (NCICU) Independent Comprehensive Articulation Agreement (ICAA). Enjoy! Attached is an invitation for community college counselors to attend an information luncheon from NCSU's College of Natural Resources on Oct. 3. Please rsvp Vonda Easterling no later than September. 25. This is a wonderful event to learn about the myriad opportunities NCSU's College of Natural Resources offers community college transfers. Attached please find the State Board actions taken on August 15, as well as revised curriculum standards for Automotive Restoration Technology (diploma), Computed Tomography and Magnetic Resonance Imaging Technology (diploma), Middle Grades Education (pre-major), and Surgical Technology (program plan of study). Please see attached information concerning Transfer Advisory Committee action items and the Comprehensive Articulation Agreement. Attached is an invitation for community college transfer personnel to a Transfer Event at North Carolina State University on June 20. Please respond to Taylor Holland by June 6. You can view the ACA 122 and CAA PowerPoint presentations from the April 18 CTPA Spring Conference from this site. Please review the attached information concerning action items from the February Transfer Advisory Committee (TAC) meeting and a modified CAA. Attached are the Minutes from the recent Executive Committee Meeting and includes information about Transfer Credit Evaluation, Transfer Core Diploma, ACA 122, TAC Updates, UNC Minimum Score Requirements, and more. Also attached is the CTPA Membership Application and Renewal Form for 2008-09. If you recall, we suspended membership fees for a year, so everyone is now due. Renewal is important to maintain accurate and up-to-date contact information. A list of the current CTPA officers is also attached. Thanks for everything you do for transfer students. 3/5/08 Register for the CTPA Spring Conference! Please find attached the registration information for the CTPA Spring Conference at Wake Tech CC scheduled for Friday, April 18. A tentative agenda and directions are also included. We are thrilled that TAC members will present an Information Session on transfer and revisions to the CAA. Other conference sessions include ACA 122, the Transfer Core Diploma, and Transfer Credit Evaluation. Our CTPA meeting at the 2008 NCCCS Conference is scheduled for Monday, October 13, 7:30 a.m. Attached are invitations to the Department Chairs Institute and Executive Leadership Program, sponsored by the NCSU Adult and Higher Education Department and the North Carolina Community College System. These are excellent professional development opportunities for academic administrators. See attachments for a numbered memo and additional information on Elementary Education pre-major; Lateral Entry; Curriculum Standards for Entrepreneurship, Nuclear Maintenance Technology, Boat Manufacture and Service; and Special Curriculum Program Application Procedures. Visit the new discussion forum for ACA 122 to exchange ideas and find out about other community colleges' development of the college success course. Click "post comment" to participate in the forum. Please see attached numbered memo from Dr. Parker (NCCCS) and Dr. Martin (UNC-GA) concerning recent TAC Action Items, including the new credits not originating provision added to the CAA and clarification of Huskins Bill, Dual Enrollment, and Learn and Earn CAA protections. Attached are the Transfer Advisory Committee (TAC) Minutes from the September meeting, including information concerning AP Credits, pre-majors, C- grade transfer, ACA 122, Huskins Bill transfer credit issue, and much more. Attached please find the Minutes to the September 28, 2007, CTPA Executive Board Meeting, including information on AP Credits; new pre-majors; ACA 122; CAA revisions and clarifications, such as D/F grades and C- transfer credit; UT Performance Standard; and the CTPA Spring Conference. I've also attached the rationale for the development of ACA 122 as a transfer credit course in case you need to use it to justify adding it to your respective Associate degree Plans of Study. Please review the following important TAC Action Items, particularly the Huskins Bill (course transfer), C- grade, and ACA 122 approval items. Note that the numbered memo supercedes CC07-210, regarding transferability for Huskins students. Also included is an updated CAA and list of transfer courses. Additional information on these specific items, as well as other issues, will be forthcoming in the CTPA Executive Board Meeting Minutes. spaces for the spring 2008 term. Priority consideration will be given to those applicants who have earned or will earn an AA/AS no later than December 2007 with a 3.0 or higher GPA. The online application is not available for the spring term so interested students will need to download and mail in a paper application. The application deadline is November 1, 2007. All decision letters will be mailed no later than November 15, 2007. Applicants must have their application and all supporting materials into the Office of Admissions by the November 1st deadline in order to receive a decision on or before November 15th. Please direct any students to our website - www.uncw.edu/transferadmissions. If you have questions about this event, please call the Career Center <http://www.uncw.edu/stuaff/career/> at 910.962.3174. **PLEASE NOTE: This is a separate event from the Transfer Counselor Visit Day on October 5. Great web site for articulation and transfer information. See Online Resources section. Please see the attached NCCCS memo regarding the transferability of Huskins Bill classes. In summary, if the transfer course credit is not part of the student's completed Associate degree or General Education Core, the transferability of the course/credits is not protected by the CAA, even if it is designated a transfer course in the CCL. It is up to the receiving institution whether or not to accept the credits. The broader implication of this is that the transfer courses of students who do not complete degree or Core are not protected. This also means that UNC students taking transfer courses at community colleges to transfer back to the senior institutions are also not protected by the CAA. The TAC has agreed to address this issue at the September meeting. Since this lack of protection could adversely impact both community college and UNC students, it might be appropriate for our UNC colleagues to let their TAC representatives know that protecting the transferability of all transfer courses serves the best interests of both community college and UNC students. Read here about the new pre-major for Special Education. The report from the UNC-NCCCS Seamless Higher Education Task Force Summer Institute and the evaluation results from the Institute are attached for your information. Thanks to Orangel Daniels for making these available. The 2007 Critical Success Factors report has just been released. Twenty-nine community colleges met the College Transfer Performance Standard. Attached is the revised CAA. Again, you should find this concise policy document much easier to work with than the previous version. The TAC did an outstanding job reorganizing the text to make it more user-friendly. Please also note the change in pre-majors language to more accurately reflect their status as advising guidelines and not "agreements". On a sidebar, let me say that I've attended a number of recent meetings and conferences on transfer and articulation and North Carolina has by far one of the most seamless transfer student processes in the country. The mutually respectful and productive working relationship between the two- and four-year systems is also absent the often rancorous debate and seething animosity that characterizes the relationship in other states. Congratulations on creating a unique environment that encourages the access and success of transfer students. Attached are the recommendations of the CTPA Study Committees. There are eight total recommendations. You only need to respond if you are voting "No" to any of the recommendations. If you are voting "No" to any of the recommendations, please respond no later than 5:00p.m., Tuesday, May 15, 2007. If the recommendations pass, I will forward them individually to the appropriate body (the TAC, NCCCS, CAOS/Instructional Administrators, and so on). Keep in mind, these are only recommendations. Whether they will be acted upon is another matter, but at the very least it will keep these issues on the discussion table. I would like to thank all the members of the Study Committees for their exceptional work. The TAC Minutes for Feb. 23, 2007, are now available. Click here to read them. Read the attached CAA Training/ Registration announcement for information about sessions the TAC will hold in April. In addition to the CTPA Spring Conference session at Wake Tech on April 20, there will also be sessions in Asheville and Wilmington for those unable to attend the CTPA Conference. Click on the above items, announced to the System via numbered memo (CC07-22), to review the plans of study. Click here to review actions taken by the Transfer Advisory Committee at the November meeting and an updated list of transferrable courses. The System Office has approved a Core Diploma track for transfer students. Click here to read their notification memorandum. Peace College endorsed the Comprehensive Articulation Agreement. Read the System Office memo and see the updated list of North Carolina institutions.